Claudia, the daughter of Rebecca and Scott Schilling of Bloomfield Hills, will play midfield at Western while planning to study business. A member of Marian’s 2017 State soccer team, Claudia is All-State and All-Catholic in soccer, and she also plays club soccer and field hockey for Marian. “Marian is a supportive community,” Claudia said, “with teachers who pushed me to achieve my best.” A member of the National Honor Society, she was also a member of the school’s Ambassador Club and a Junior Mentor. The daughter of Debbie and Glen Surratt of Madison Heights, Julia will play midfield for Trine University in Angola, IN where she plans to study early childhood education. She also was a member of Marian’s State championship team in 2017, and she played hockey and basketball, as well. Julia belongs to the National Honor Society, SADD, and Ambassador Club in addition to being a Junior Mentor. “Marian challenged me and pushed me to do my best,” Julia said. Zoe, the daughter of Heidi and Edward Hudson of Rochester Hills, will play defense for the Bowling Green soccer team; she hopes to major in sports management. Zoe has played in the ECNL National Soccer Championship on a U17 team. “Marian has shaped me into a leader,” she said. Gabby Granata is the daughter of Pam and Robert Granata of Bloomfield Hills. She signed to swim at Williams College in Massachusetts and plans to study psychology there. The captain of Marian’s swim team, Gabby has received All State, All County, All League and he Coach’s awards. “Marian gave me strong bonds of friendship, community, and faith,” Gabby said. “It build the foundation for my future.” Gabby is also a member of the National Honor Society at Marian. The daughter of Patricia and Mark Heacock, Julia will play defensive field hockey at SUNY-Oswego where she plans to study accounting. 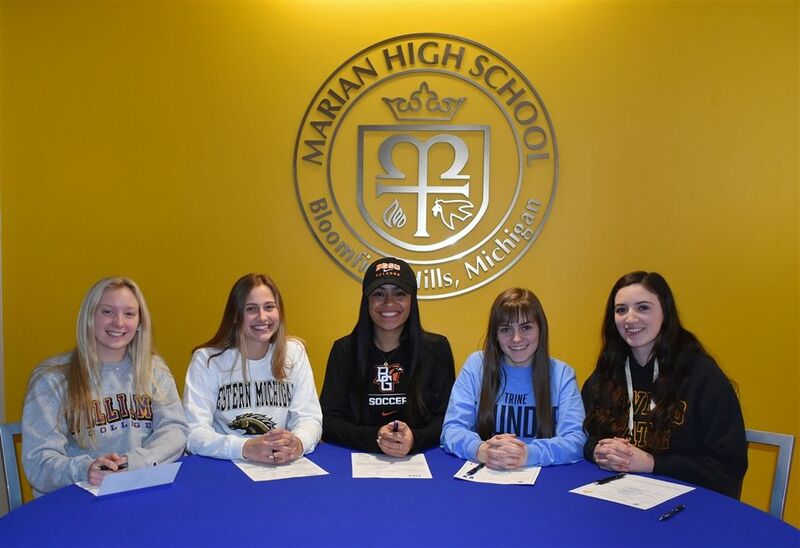 In addition to field hockey, Julia played both basketball and soccer at Marian. A member of the National Honor Society, she also volunteered at Baldwin Soup Kitchen.